Sailstice is a worldwide celebration of sailing on the weekend closest to the summer solstice – this year the solstice falls on Saturday, June 21, 2014, which also marks the first day of summer. We are celebrating this year by offering a free sailboat rental* when you sign up for any of our small boat sailing classes beginning on June 21. If you have ever wanted to learn to sail, or take your sailing to the next level, there has never been a better time. On June 21, we have classes beginning for Basic Sailing, Advanced Sailing, Hobie Cat Sailing, Laser Sailing, Keelboat Sailing Levels 1 and 2, and our brand new Performance Sailing class. For those that have completed our Laser Sailing class, Performance Sailing teaches advanced sail trim, proper body mechanics, roll tacking, and roll jibing while developing boat-handling skills. This class will also introduce small boat racing tactics and mechanics. View the Sailing class schedule at www.mbaquaticcenter.com/sailing. 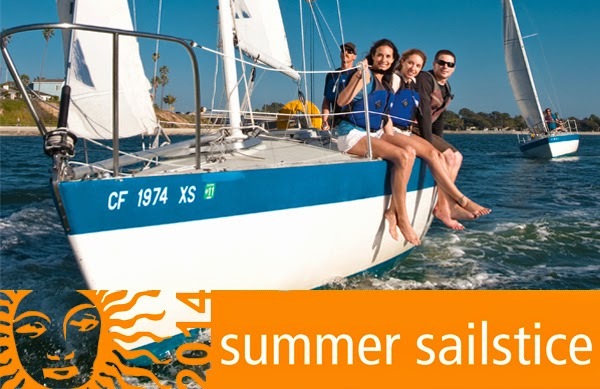 Come celebrate the Summer Sailstice at MBAC and score a free rental when signing up for a sailing class today!